San Cristobal lies closest to the cruise ship piers in Old San Juan. Indeed, it is clearly visible from ships docked at Piers Nos. 3 and 4. 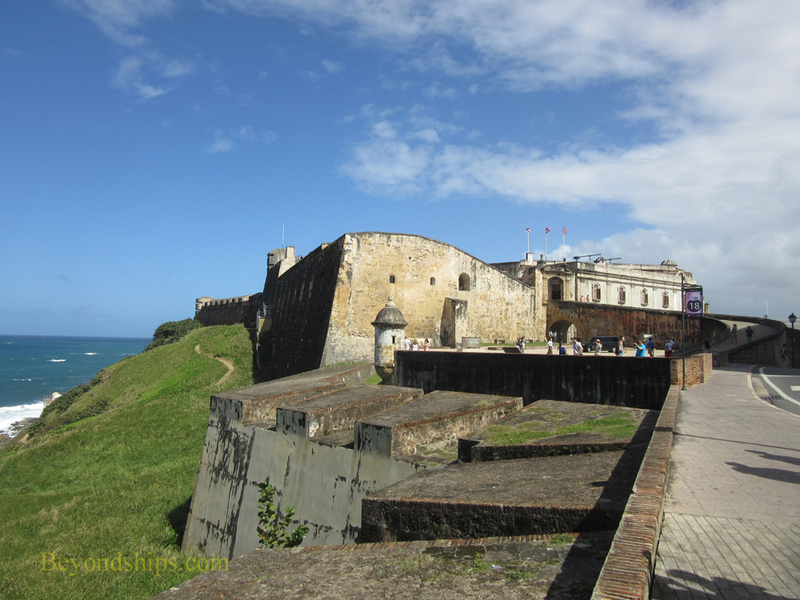 To get there, you simply walk up the hill a short distance past Plaza Colon. There are signs directing you to the fort's two entrances. The main entrance is by the Visitor Center on Munzo Rivera Avenue The Historic Entrance is further up the hill on Calle Norzagaray. The walk takes 10 to 15 minutes. Alternatively, you can take one of the tourist trolleys from the cruise port up to the fortress. 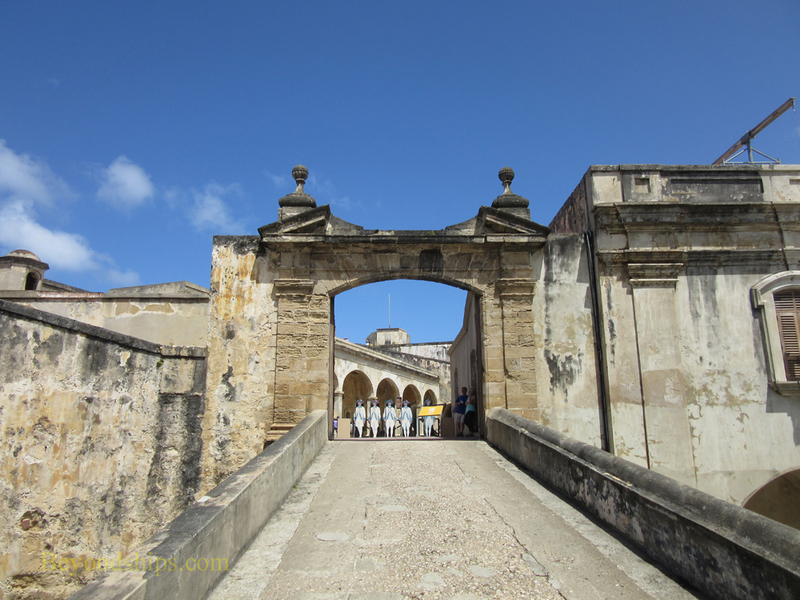 (The trolleys will also take you to El Morro). However, the trolleys are popular and you may have to wait especially if a ship has just come in and there has been the initial throng of passengers going ashore. As of this writing, the entrance fee is five dollars. However, that entitles you to enter both fortresses. Also available are various passes (e.g., annual passes, lifetime passes). Inside San Cristobal, the architecture is utilitarian. Although both San Cristobal and El Morro are called castles, they were never the seats of royal courts or the homes of noble families. They were military defense establishments and so there is little in the way of decoration or ornate architecture. Everything is functional. Just beyond the Historic Entrance, you come to the main plaza. Here, on an hourly basis, park rangers meet with visitors to give orientation talks. 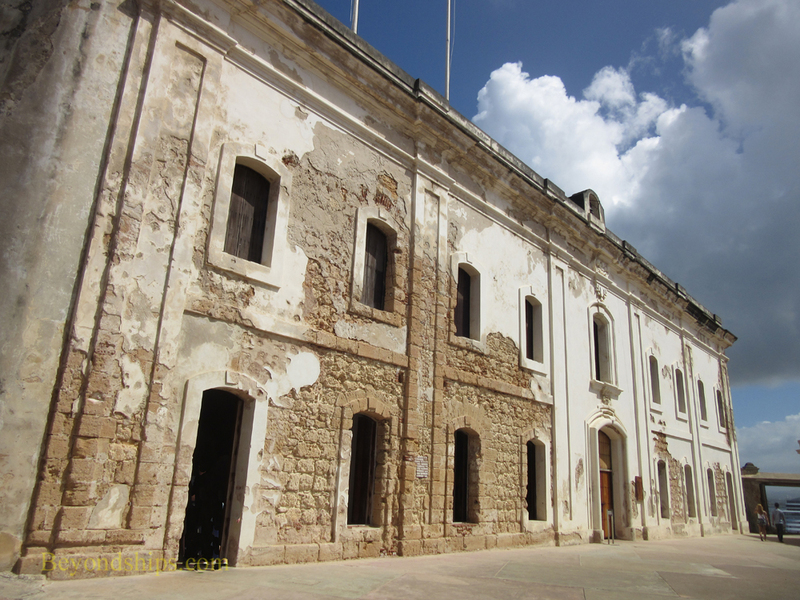 Also, in some of the buildings bordering the plaza, there are panels and displays telling the history of San Cristobal. A movie about the park is shown throughout the day. Most visitors choose to explore the fortress on their own. San Cristobal was the largest fortress built by the Spanish in the New World and even though a third of it was removed in 1897 to permit expansion of the city, it is still quite big and is rather spread out. It is also built on three levels so some climbing is involved. The surfaces are often cobblestone or otherwise uneven. Passing tropical rain showers can also leave them slippery. Consequently, you do have to be careful walking around. The Park Service has placed signs at various points around the fort to tell you what you are looking at. There is also a pamphlet, which provides maps and helpful information about the two forts. There is not much in the way of recreation. However, one of the barracks bordering the plaza has been furnished so as to depict how the soldiers lived in the 18th century. It is Spartan to say the least. A stone ramp leads from the main plaza up to the observation level. 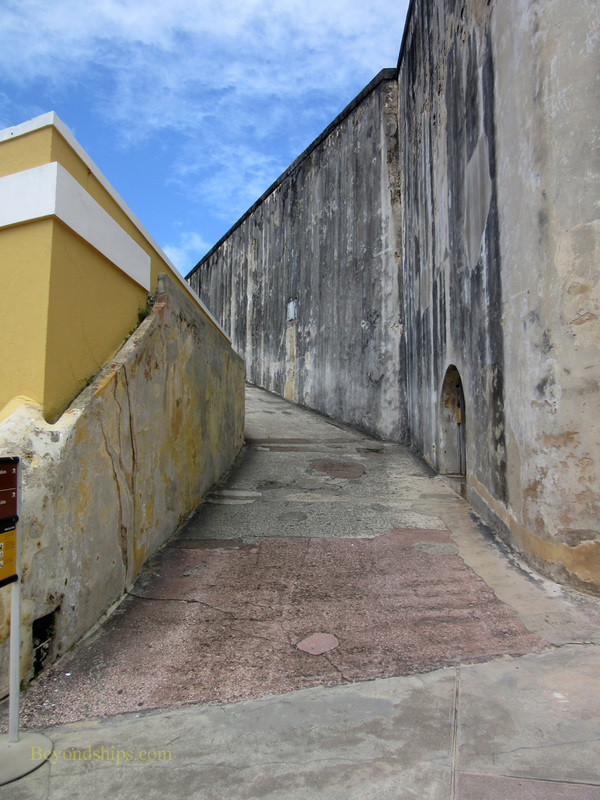 The reason the Spanish built a long ramp rather than a staircase was to be able to move cannons and supplies between the levels as needed. Indeed, unlike Medieval castles where the primary defensive weapon was the bow and arrow, much of the design of these fortresses has to do with cannons. They had to be built so as to facilitate the firing of cannons both out to sea and against armies approaching from land. In addition, they had to be built so as to protect the garrison from enemy cannon fire. Even today, you get great views from San Cristobal. On the north side, you can see westward along the rugged coast up to El Morro and eastward past the capital building to the new city. To the south, you get a good view of San Juan and the cruise ships docked in the bay. A long tunnel connects the main plaza to the main battery level. San Cristobal was built with a network of tunnels that allowed troops and supplies to move about while protected from enemy fire. Explosive charges could be detonated to close the tunnels if the enemy ever succeeded in breaching San Cristobal's outer defenses. The tunnels were also used for other purposes. 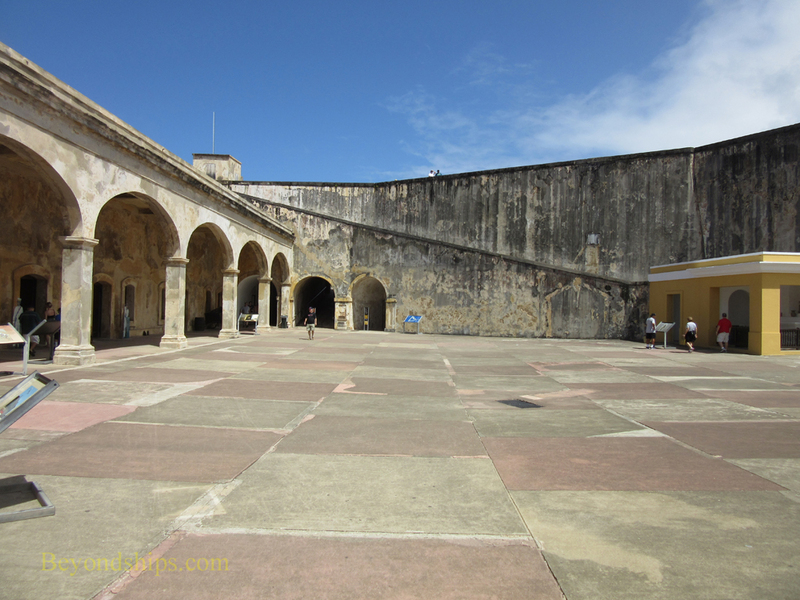 For example, there is a dungeon off the tunnel leading from the main plaza to the main battery. The Park Service gives a free tour of the tunnels once a month. The main battery was where most of the fort's firepower was located. Today, the cannon embrasures are empty. However, you do get a nice view of the Garitas - - the domed sentry boxes, which jut out from the walls. 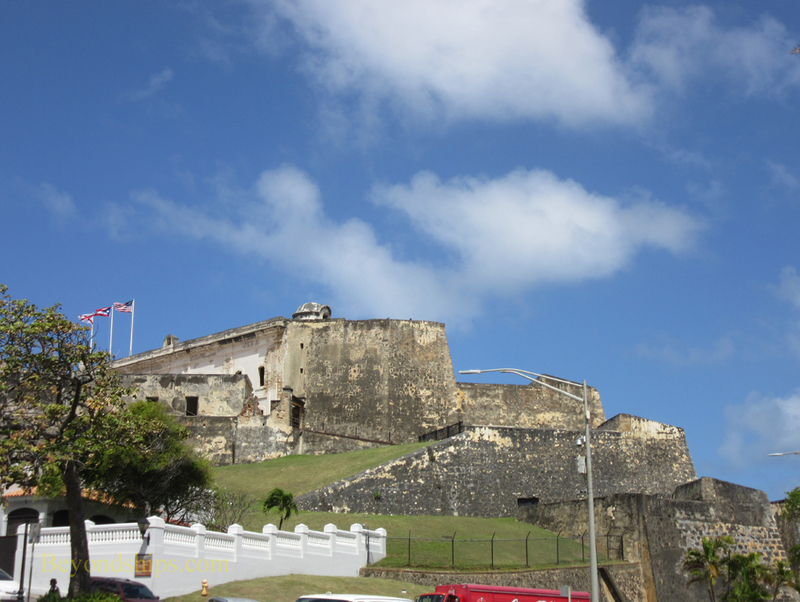 Features of both San Cristobal and El Morro, these romantic looking structures have become a cultural symbol of Puerto Rico. 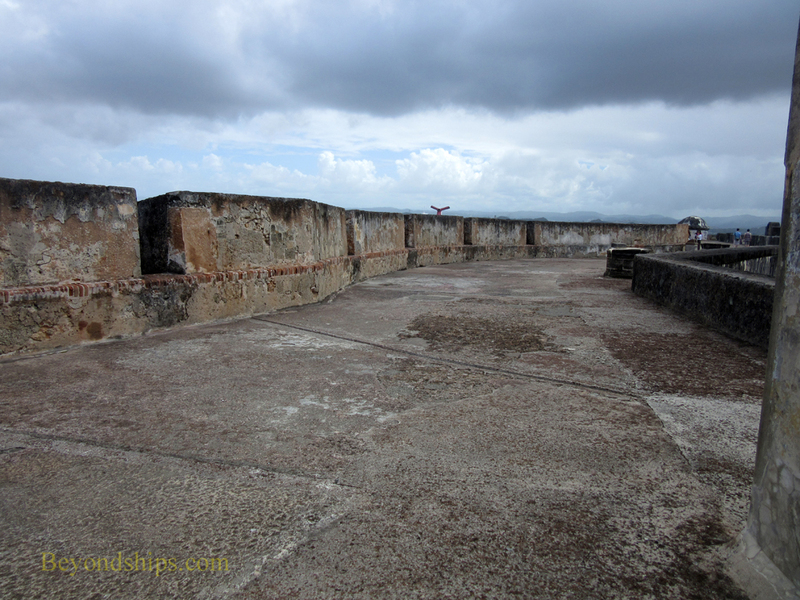 Above: Looking towards the Historic Entrance to San Cristobal. Below: The gate at the Historic Entrance. 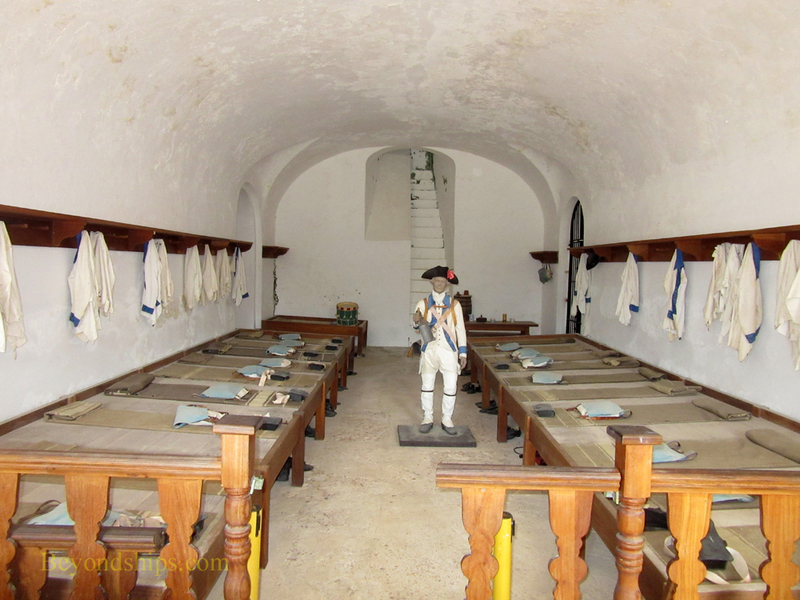 Below: Recreation of soldiers' living quarters. Above left: The ramp leading to the observation level. ​Below: The main battery area.